I spent last Sunday playing with some new stamps and new inks. I got my new Waltzingmouse Stamps over the weekend and I got a lot of new dye ink from Close to My Heart last week. So play I did. I haven't tried all the ink colors yet, but I already have a couple of favorites: Outdoor Denim and Chocolate! 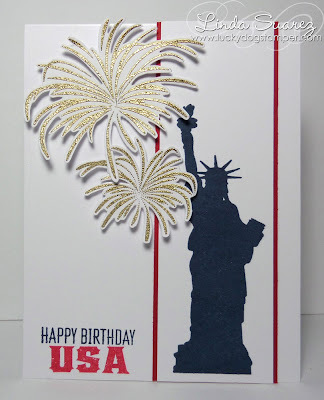 When I saw the new sketch at the Seize My Birthday challenge, I couldn't wait to ink up the Statue of Liberty stamp in the Waltzingmouse USA 1776 stamp set. And I could use my new fave Outdoor Denim ink too! Woohoo! Fabulous coverage for a dye ink! And I love the fireworks - they are gorgeous heat embossed in gold! Fussy cutting the fireworks was a lot of work but it had to be done - I love the look! This was a super fun card to make! Great patriotic card, Linda! I love the glittered fireworks. I just dropped by to thank you for your very kind comment you left on my blog and that I hope you enjoyed your visit and come back again soon. I took a little tour of your creations and really love your CAS style. I especially thought your foxy card for the FMS#88 was so adorable. Oh love the gold embossing!!! Thanks for joining us at Seize the Birthday! This is completely cool! You nailed the sketch and created a fun, fun card, Linda! Thank you for joining us at Seize the Birthday!